infectious disease « Howard J. Bennett - Pediatrician and Author in Washington, D.C.
How does a circumcision heal? I’ve been practicing pediatrics for over 30 years, and I have never seen an infected circumcision. If this were to occur, the redness would extend from the glans to the shaft and then towards the baby’s body. If you see this, call your doctor right away. At the time of birth, a baby’s umbilical cord has a shiny, off-white color. Over the next few days, the cord will dry out and turn a dark brown or black color. As this happens, the cord will shrink and often looks like a scab on the baby’s abdomen. In the past, the umbilical stump was coated with a blue dye after birth and parents were told to clean the area with rubbing alcohol at every diaper change. These recommendations were discontinued because they were found to increase the time it took for the cord to fall off. Nowadays, parents don’t need to do anything special other than keeping the stump from becoming irritated by the baby’s diaper and avoiding baths until the cord falls off. A few things may happen that worry parents during the 7 to 10 days that it takes for the cord to fall off. The base of the cord may develop a gooey, greenish-yellow appearance. This is normal and not a cause for concern. The cord may smell bad. The reason the cord falls off is because it no longer has a blood supply, and the baby’s immune system is rejecting the dead tissue. 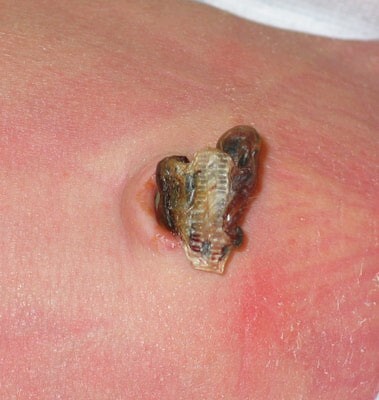 If the stump became infected, the skin around the belly button would become red and swollen. If you think your baby’s umbilical stump is infected, you should see the doctor promptly. The cord may bleed a little before or after it falls off. If this happens, you can gently clean the excess blood with a cotton swab. A red, fleshy lump may appear after the cord falls off. 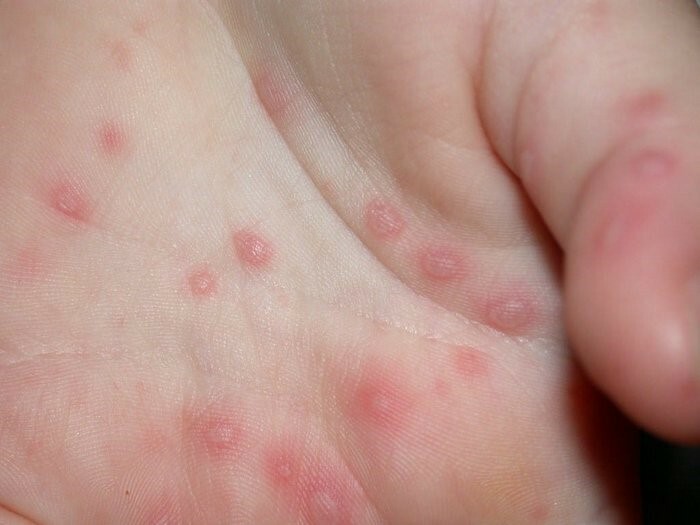 This is called an umbilical granuloma. It’s not serious, but doctors treat the area with silver nitrate to make the lump fall off. Which bug repellants are best for kids? If you spend time outdoors with children, you’ll need to keep them safe from mosquitos, biting flies and ticks. For young infants, the best approach is to protect them with clothing or nets that cover their strollers. For older children, you’ll need an insect repellent to get the job done. DEET can be used with infants as young as 2 months, but the American Academy of Pediatrics (AAP) recommends not using products with more than 30% DEET: http://www.healthychildren.org/English/safety-prevention/at-play/Pages/Insect-Repellents.aspx. Lower concentrations of DEET work well, but last for shorter periods of time. A 10% concentration lasts for about two hours. I prefer an ingredient called picaridin because it works almost as well as DEET, but feels nicer on the skin. 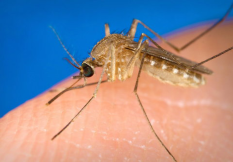 If you want a natural product, the soy-based repellent in Bite Blocker lasts about 90 minutes. If you use a product containing DEET or picaridin, a lotion or pump spray is safer than an aerosol. Don’t apply it to your child’s hands and be careful to avoid the eyes, nose and mouth. It’s also a good idea to wash it off when you come inside. You should not use products containing insect repellent and sunscreen. Instead, apply the sunscreen first, wait until it’s absorbed, and then apply the insect repellent. Keep in mind that sunscreen should be used liberally and reapplied every two hours. Bug sprays are applied sparingly and many should not be reapplied. Always read the instructions that come with the product you’re using.